What’s it about? Miyako Arata has just been transferred to the Shinjuku Nocturnal Community Relations Division, which is dedicated to keeping the ward’s peace and making life better for its citizens—or so the paperwork says. What it doesn’t mention is that the division specifically deals with supernatural beings. Initially unaware that he had powers at all, Miyako quickly realizes he has one thing his coworkers don’t: the ability to understand what their charges are saying. I think I might’ve gotten hit by a DeLorean and woken up in 2006, because that’s the best explanation for what I just watched. 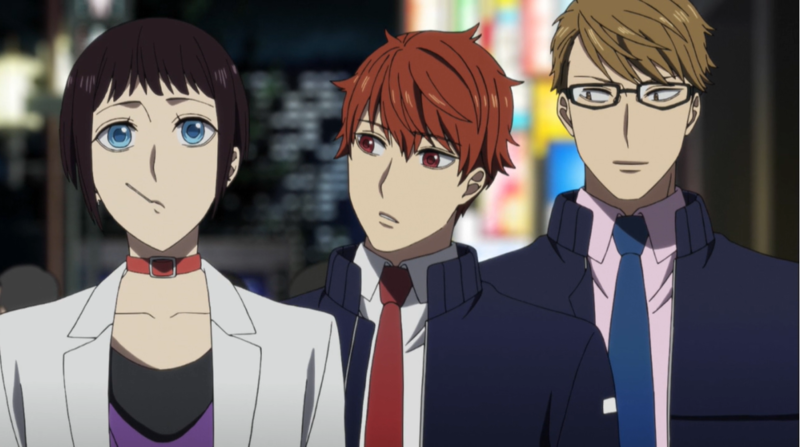 Midnight occult civil servants belongs among its brethren Descendants of Darkness, Tactics, and Saiyuki RELOAD GUNLOCK: slightly stiff-looking supernatural adventure shows staring a collection of pretty boys the show wants you to ship but won’t explicitly get together. It’s the kind of series I watched in droves as a teenager, which I suspect is making me look more kindly on this premiere than it objectively deserves. This is not, strictly speaking, very good. The first half of the episode feels like it’s being played at double speed, zooming past an introduction of the setting and some wacky coworkers with barely any room to breathe. The monster-of-the-week conflict is a completely boilerplate Romeo and Juliet plot between an angel and a tengu. And because the show saves the fact that Miyako is the only one hearing them as a twist, a huge chunk of the episode is a frustrating watch of characters acting illogically for seemingly no reason. It ultimately makes sense, but it wastes a lot of time that ideally could’ve been spent actually endearing the viewer to the cast. The most interesting—and correspondingly, even more 2000s—plot element is introduced in the last minutes and closing credits. Here, it’s revealed that Miyako is probably the reincarnation of “Abe no Seimei” and has a connection with a spirit of currently indeterminate gender. When feminine-faced mad scientist Seo (who has escaped from the wardrobe department of Weiss Kreuz) rolled in and started yelling at the ostensible staff womanizer Sakaki about his habit of fending off women by showing a photo of Seo as his “girlfriend,” it was like coming home in a thoroughly self-deprecating way to my old terrible taste. For anyone who doesn’t get a hit of nostalgia or camp from this premiere, though, there’s not much else on offer. The writing isn’t spectacular, the character designs have slightly uncanny proportions, and I doubt it has much narrative ambition outside its admittedly sweet but on-the-nose theme about communication. If you’re into cheesy bishounen shows, it might be worth a look, but it’s not worth dropping everything to seek out.